In the past, as a student you were able to view summaries of their advising appointments in a system called AdvisingConnect. Beginning on January 9th 2016, students were given access to a new system called OnCourse to view their advising summaries. These summaries are written by your academic advisors to give you a record of advice you have been provided, and can serve as reminders of referrals you were given or task which you may need to complete. Reading your notes is an important part of being a student at Ohio State. Check your notes at least once a semester. http://go.osu.edu/oncourse: using this URL you can log in to the OnCourse System. 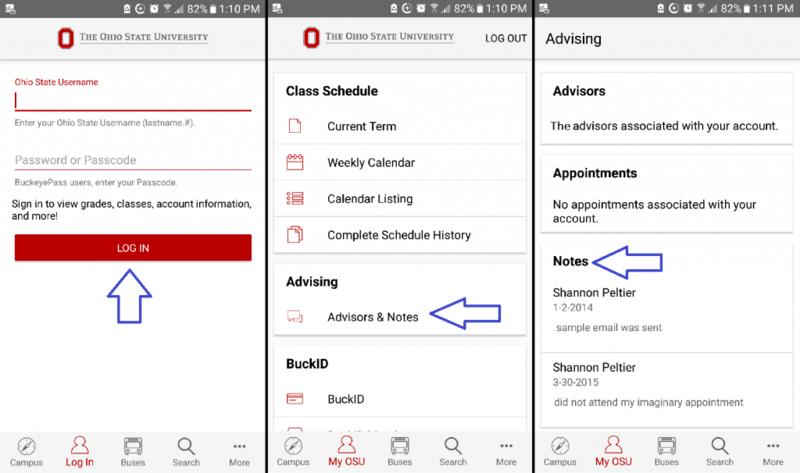 It is also available using a button on buckeyelink.osu.edu labeled “Advising Appointments and Notes (OnCourse)”. If you log into the buckeyelink.osu.edu page you can make this button a favorite. We created space to introduce you to this new system. There are two ways you may learn more about OnCourse; you can either read content or watch a video. For information on scheduling an advising appointment, please click on this link (https://www.screencast.com/t/DTuD8Z259tF) to watch a brief video.